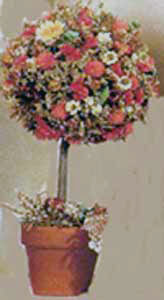 A dried floral tree can be made for various seasons or for a particular occasion. You can use any container that fits your decor and you can make them any size you want. For the Fourth of July you can use red and white flowers with a blue vase. For Halloween and Thanksgiving you can use orange flowers. You can make them for any holiday or special occasion. Clay pot or pot of your choice. Polystyrene ball, 1/2' to 1 inch less in diameter than your pot. Branch or dowel about 3 times as long as pot diameter and 1/4 to 1/2 inch in diameter.. Using an old bowl or can, mix a quantity of plaster of paris with just enough water to give it a thick consistency. You will want at least 2 to 3 inches of plaster in the bottom of the pot. Pour the plaster of paris into the pot and insert the dowel or branch in the center. Allow to harden. When the plaster is dry, push the polystyrene ball several inches onto the trunk. Loosely cover the ball with filler material such as baby's breath, hydrangea, German statice or moss. If you use moss decorate the tree by hot gluing dried flowers and leaves to the moss. You can attach dried flowers by attaching floral picks and inserting them into the ball. Small loops of ribbon can be added by gluing or wiring to floral picks. Cover the top of the plaster with glue and add moss and a few flowers. If you have any questions or would like to offer any dried floral tree ideas to share please contact me.